Whole House fans Really Can Work to Lower Your Air Conditioning Bills and Lower the Temperature of Your Home, But Most Don't Work. They can only bring your home internal temperature down to the temperature outside. You are drawing in outside air and if the outside air is 90 degrees, your home will be 90 degrees. They work well to lower temperatures in the late afternoon and evening hours. 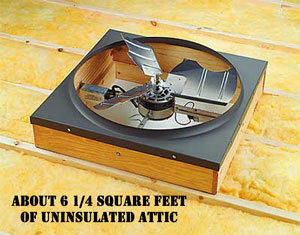 They are usually installed without adequate attic ventilation. The whole house fan motor assembly at the top of this page will move about 7,000 cubic feet of air per minute when installed correctly. Installed correctly means 1/8” of static pressure. I order to get to this low level of static pressure the size of the attic ventilation screens need to be large. The size of a 5 ton return air register moving 2,000 cfm needs to about 14” x 36” or about 500 square inches total surface area. 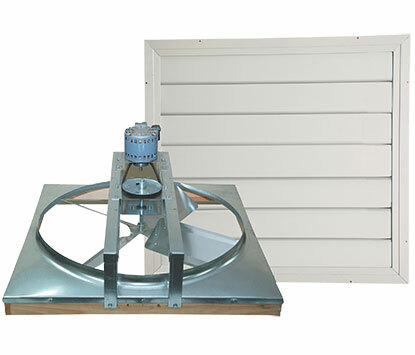 The average sidewall attic ventilation screen is 14” x 30” or about 420 square inches of surface area. You need about 1750 squares of outside ventilation screen or 4 average sidewall attic registers. Most attics have two. This means the airflow is dramatically decreased and the airflow from the whole house fan is cut down to below 2,000 cfm. Most homeowners turn them off during meals and family time, just time when you need cooling the most. They dramatically contribute to poor indoor air quality. Sure, we here about indoor air pollution being worse on average than the outside air, but here you are getting both and getting both in great quantities. When the fan turns on it draws air from open door and windows from the opposite side of the home or from downstairs. This air is pulling in pollens, dirt and debris contributing to a dirty dusty household. Now combine this with pressurization from the attic. The drywall in your home is not air tight. When the attic is pressurized by the whole house fan the air from the attic is forced through the drywall and every little crack and imperfection in the ceilings of your home. This pushes dirty contaminated air into the home. This is not a device for allergy sufferers. There is no way to filter this air. If you live near the beach, whole house fans work great during the summer. I have one in my own house and use it for an hour or two after getting home for work. The ducted fan on this page is an attempt to answer the problem of excessive noise. It is a poor remedy for a whole house fan. This unit is hooked up to a 16” duct. This unit will move far less than 2,000 and my guess is that it will move on average about 1,200 cfm. Not nearly enough air flow to create the breeze needed for whole house fans to work effectively. Whole house fans and the winter months. This are absolute horrific wastes of heating during the winter months. The surface of the whole house fan is a metal or plastic dampener that opens when the fan turns on. It opens with the force of the air moving. It is not a motorized dampener and it has virtually no R-Value. A thin piece of plastic, aluminum or steel is a direct shot to the outside elements. Everything works great and I am very pleased. 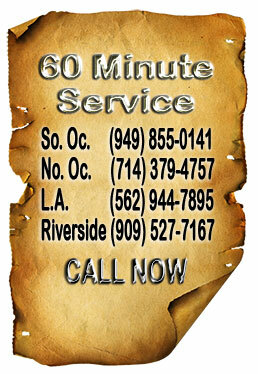 Their courteous and professional manner is very much appreciated, as was the craftsmanship. They were prompt, knowledgeable and solved my problems.